Just few days of the launch of Windows 8, many people still wonder how successful the new system is operating or those of Microsoft. 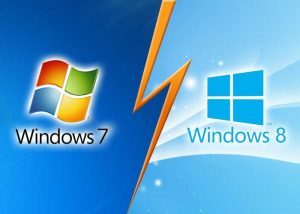 Some believe it really will be an improvement on what we already know, while there are others who cite the fluctuating performance of its versions (a theory by which Windows editions alternate between good and bad, what makes you think Windows 8 be “bad” compared to everything good in Windows 7). What is certain is that the new OS is different. It is for this reason that in this article we will see five essential differences between Windows 7 and Windows 8 in order to have a clear idea about what we will find in the new system from Redmond. At this point with Windows 8 just around the corner, surely you’ll be drenched in the proposed new Microsoft visually. The former beauty Metro (now Modern UI) is one of the most radical changes between the new system and its predecessor (in fact, compared to all his predecessors). The break is given by adopting a more minimalist look and sober, which predominate flat colors, rectangular shapes and visual simplicity. Obviously, this change responds directly to the search to insert the OS on the market for touch devices. Another new feature of Windows 8 from Windows 7 is about how to install and get new tools for the system. It is now the OS will contain its own app store, where you can download and buy all kinds of utilities that will integrate quickly with our work environment. This is another idea taken directly from smart phones and how they function. Even, it has been extended to the point of forming the Live Tiles (i.e., mosaics “live”) in which dynamic display information and notifications, as the number of unread emails, weather conditions and the latest news. Integration with the cloud and with the tools housed there was gradually abandoning their extra service character to become a “must have”. Well, Microsoft could not ignore this, why Windows 8 is the first operating system from the company that has introduced such a connection in the center of their experience. This is clear in three of the developments regarding Windows 7. On the one hand, the option to access our account Microsoft allows us to bring our desktop experience to any device with Windows 8. Also, it involves introducing SkyDrive, storage service in the cloud that will be offered as the default option for saving our content. Finally, stomp social networks within Windows 8. Unlike its predecessor (which did not include a direct and constant Internet), this OS is closely related with social networks like Facebook, Twitter and LinkedIn for the latest activities of our contacts in such portals. Windows 8 was developed with touch devices in the head. This is one of the biggest differences with Windows 7, because it was designed exclusively for desktop comfort. Meanwhile, Windows 8 aims to become a cross-platform system that allows off-road and get the same experience from any device. Windows 8 will mark the end of that advanced nook known as BIOS. Instead, the new OS will put a software start up with a strong emphasis on visual simplicity, which will manage the options in the system more simple and intuitive. So, there we will find more powerful tools and effective system recovery, as well as a section to adjust the UEFI (the new name of the BIOS).